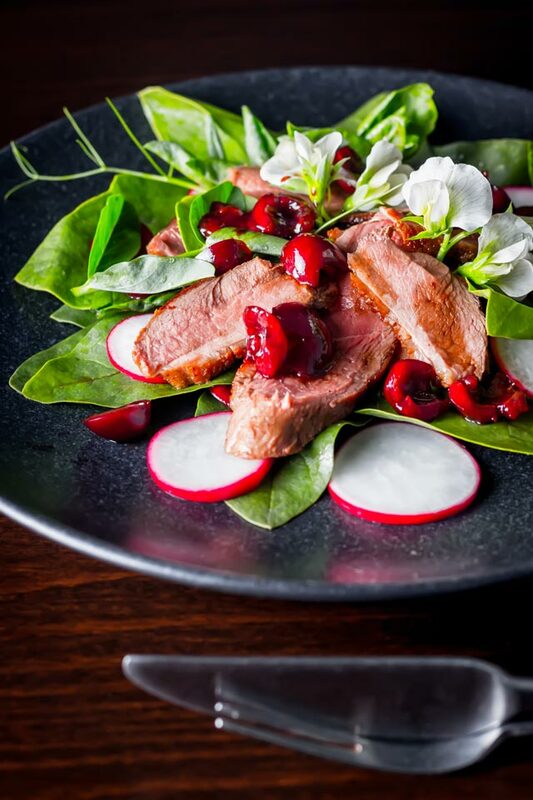 Lovely rich duck breast is the perfect match to seasonal cherries and the sharp sweetness of balsamic in this great summer duck salad. I posted a duck salad a while ago and it really has become my favourite meat to have in a salad. 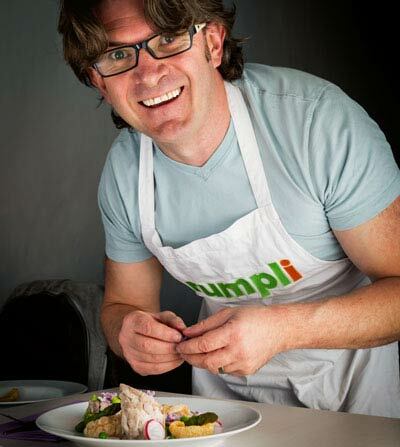 The strong flavour permits the use of less meat and it really stands up well against strong flavours and as far as I am concerned every salad needs strong flavours. 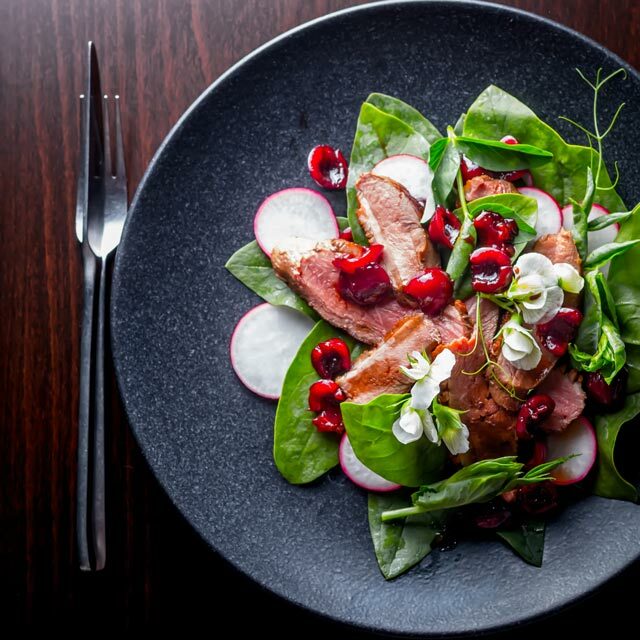 This duck salad is 100% inspired by my garden at this time of the year. Whilst I do have ducks in the garden rest assured none were harmed in the making of this recipe. It is the time of year when our garden sounds like a scene from ‘The Birds’, starlings adore cherries and the first of our cherry trees is now heavy with ripe fruit. Which now means that said tree now looks and sounds like a starling tree and I need to get them used up before the starlings take them all. Add a little spinach, pea shoots and maybe the odd blossom or two. Then some radishes from the garden mixed with a little store cupboard love and you have one seriously delicious salad. This time of the year is so very exciting for the kitchen gardener. Whilst many of the spoils of war are still in the flourishing stage there are still many things you can play around with and create wonderfully simple but fresh and beautiful dishes. This food is far from complicated but it looks spectacular and eats really well with the added bonus of being really nutritious and perfect for a days when the temperatures are rocketing. Admittedly I do have a large garden, 1,000m² set aside for growing vegetables alone, but you can do a huge amount with just a small space or even a balcony. You can grow potatoes in a bin, whilst planting enough peas to get a good pea harvest in a small space is tough but pea shoots and flowers as in this recipe provide a lovely light pea flavour to a dish. We all know how much shop bought herbs cost, stick out a pot and grow your own, it really is very simple. As with all cooking of meat you should have it to your liking and using a meat thermometer is the perfect way to nail the cooking process, here are some guidelines for duck after resting. Clean the radish and slice into 3mm slices. Pit the cherries with a cherry stoner or olive pitter and cut in half. Score through the duck fat in a hatch pattern and then season the duck breast with salt and pepper and place in the frying pan skin side down until the skin is crispy, this should take 3-4 minutes. Then flip and cook to your liking, I like medium for this dish so cook until the internal temperature reaches 56°C before removing from the pan. This should take around 15 minutes in total. Set the duck breast aside and allow to rest for 5 minutes covered with some baking foil before slicing thinly on the diagonal. Pour out the duck fat from the pan leaving just a scant covering, then add in the balsamic vinegar and the cherries and bring heat to just warm. If you are not using pea shoots or blossoms you can add in some lambs lettuce or rocket. The cherry sauce with balsamic and duck fat sounds fabulous! 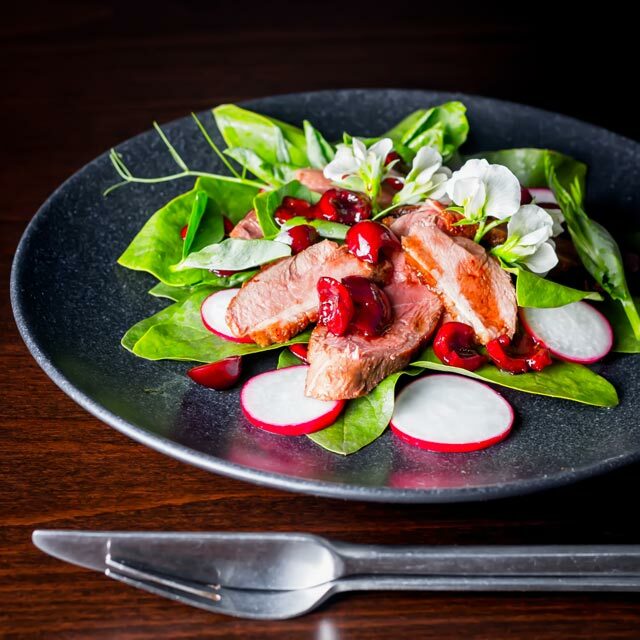 It is sooooo good, I love duck and cherries and the balsamic adds that touch of acidity to cut the sweetness of the cherries and richness of the duck. My husband would go wild for this, and with Father’s Day coming up, it’s perfect timing, thanks! Such a beautiful salad…can’t wait to try it. Duck has got to be one of my favourtie ever meats so drooling over this recipe like no mans business. Same here, it is such an underused meat with so much flavour! What an absolutely gorgeous salad! I love the duck and cherry combo. It looks delicious. Your garden sounds fantastic! With the drought here in California, I’ve had to forgo mine for the last two years, and I really miss the homegrown produce! Thanks Tracy, shame about the weather… Hungary also has long hot and dry summers so it is often a pitched battle with mother nature to keep things watered, we had a bore hole drilled so we can try and keep on top of things but it is still a challenge! Oh, My Gawd! This looks so heavenly to me! I’m jealous about your cherry tree – my favorite fruit ever and you can just pick them in your own back yard. Lucky dog! I haven’t made duck in a long time, but this really looks special! Hmm…. Such a gorgeous salad! Love the bright colors. I have never paired duck with a salad before. It sounds delicious. 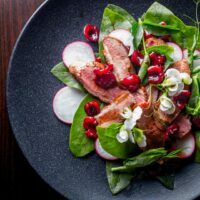 It works really well with a salad, the big bold flavour of duck allows you to really punch up te flavours in the salad and still retain the flavour of the meat in the dish. I often find that chicken gets lost in big bold flavours and becomes a texture rather than a flavour. I LOVE duck and this sounds so delicious. This is perfect for a great weekend dinner party!! Me to Gloria, duck is su versatile, everything from winter stews to summer salads and the strength of flavour is amazing.